Part 2 - I was totally wrong about patchwork! Photo courtesy of Maura Grace Ambrose. So this post follows on from Part 1 - I was totally wrong about patchwork! but starts from a "how do they do that? HOW are those quilts so beautiful?" perspective. After explaining how I have fallen in love with patchwork over the last few years, I wanted to take it a step further today and tell you about some of the things I think that make their quilts so amazing. I also feel the need to say that I might totally be stating the obvious in this post - but for me it took some time to figure out what they had in common that I loved - so I thought I would share. At the end of the post I am going to suggest some other patchworkers/quilters you might like to have a look at and a couple of artists I like who make quilt like art or art that looks like quilts. There are so many other makers out there to inspire you to give patchwork a try. Quilts have always been about form and composition. But each of these quiltmakers has put their own stamp on tradition. Hopewell through their use of simple shapes - some of them remind me of Rothko or Albers paintings - make simple but really interesting quilts combined with what they do with colour. Lindsay Stead does it with her use of traditional patterns at different scales - she talks about her process a bit in this video on her site. Maura just appears to fiddle with traditional patterns and makes magic - she seems to deformalise the formal. And Meg talks about using a traditional methodology and fiddling with it to get her amazing strip quilts. This I think is the key - but I'm finding it tricky to explain. Each one of these quilt makers use this "trick" where the quilts aren't just flat colour. For example instead of using a single dark colour, they use two (or more) very similar colours as their "dark". They use this trick in different but clever ways to make quilts that have so much more depth and life than they would if they just used flat colours. This is best way to show the similar colour trick is through pictures methinks. 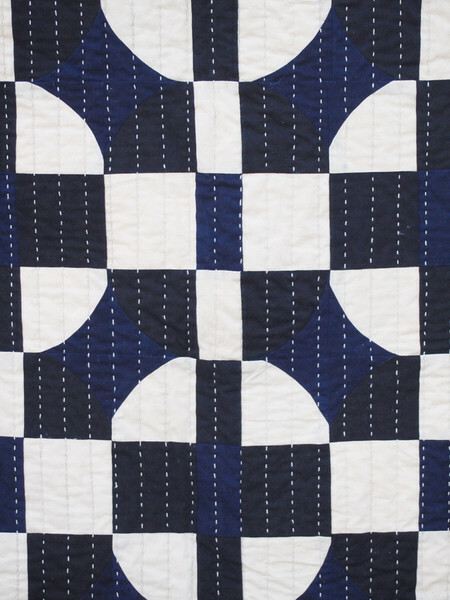 The Georgia quilt below actually uses two different flat cottons - one navy and one black as the "dark" in this quilt. Until I saw this quilt it would never have occurred to me to use two similar colours and especially not navy and black. Seeing this was one of those life altering moments. My reality shifted a little. I mean look at it! It totally blew my mind....how clever does Maura want to be. She then gets a little cleverer. Maura now uses her own naturally dyed fabrics, which means that the fabric itself has subtle variation in it and isn't flat (this is like the effect of a semi-solid for all you knitters out there). This is beautifully shown in her Idaho quilt below - what could have been quite a dramatic sharp quilt is softened by the use of the naturally dyed fabric. Often there is variation in both the background and the feature colour of her quilts. Photo's courtesy of Maura Grace Ambrose. Linday Stead does this thing in many of her quilts, where she uses flat colours but two slightly different shades of the one colour. There are two examples below. This is so simple and yet so effective. Two different reds - Photo courtesy of Lindsay Stead. Two different background colours - Photo courtesy of Lindsay Stead. Meg Callahan does this sometimes by using a dyed fabric in just in parts of the quilt - like the red one. Or in the black one below the dyed fabric is used as the dark fabric throughout the whole quilt. The use of colours which are harmonious (close to each other on the colour wheel) create a harmony of effect. The contrast is subtle, so the effect is subtle. The colours sit together like good friends. But by having more than one flat colour, the effect creates more interest. There is variety, texture, depth, subtlety of difference. There are so many examples of this out there when you start to look. I talked a little bit about value in my colour post but these people use value so cleverly. Many of the quilts combine the use of high contrast with the use of the similar colour trick. These create quilts that are quite dramatic quilts but because of the similar colour trick, they aren't hard and crisp but instead have a softness to them (in my opinion). Claire and Eliza of Hopewell do something similar to the similar colour trick but in a totally different way. They use less subtle differences in colour than the other makers but they do often use multiple shades of a particular colour. These shades are then further varied through the use of prints and patterns and (I think?) shot cottons and chambrays. A shot cotton is one where the warp and the weave are made with different coloured yarns which means the colour changes as you look at it from diffferent angles which provides depth. For example - when you look at it from a long way away, the background in the quilt on the right looks like a creamy grey. Up close it is a grey dot on a cream background. This again creates interest but the harmoniuous nature of using shades of one colour give these quilts their simple joy! Most of these people I know of via instagram. It is a wonderful resource where many makers are posting about their process. You can learn many things just by looking at the pictures. Doreshandmade - Uses form and composition, similar colour trick and the multiple shades thing. This one is a lovely example of all that. There is also something else in there that I haven't yet put my finger on. Counterpane - Handmade quilts and custom handiwork by Pauline Boyd. These quilts are something special and don't fit in with any of the stuff I spoke about above. They are just art really. She uses fabrics from Ilana Kohn and Ace and Jig to produce these beauties. Have a look at her instagram stream as well. Make Something and The Workroom - Karen's blog is Make Something and her business is The Workroom - she is based in Canada. For years she has consistently surprised me with a more traditional style patchwork that sings. The star I made for the Freedom Patchwork front picture was based on one I saw on a quilt she featured. The Purl Bee - This is the blog of Purl Soho. These guys are a masterclass of colour and the similar colour trick. Have a look at their quilt page. I've been on their mailing list forever and they just keep coming up with the goods, month after month after month. Other artists to look up whose work may interest you would be Louise_Bourgeois or Agnes Martin. Also have a look at Ethan Cook. You need to do a google search for images as his website is almost completely bare. I would love to hear of others I should look at in the comments. PS. I said it on the last post but in case you missed it - we are teaching patchwork at our retreat in September. The lovely Melissa of Tiny Happy fame is coming from NZ to spend a super day skilling you up in our Freedom Patchwork class. PPS. Part 3 of this post is now up on the blog.